As of today, the acknowledgment of the identity and freedom of self-determination are the two major challenges of the indigenous people. In Indonesia, there are about 50-70 millions indigenous people relying on the sustainability of natural resources. However, the phenomenon of climat changes are then present and poses its own pressure for the survivability and self-determination of those indigenous people. One of the examples represents the conditions and faith of Orang Rimba in Jambi, Indonesia. These indigenous people inherit the faith of their ancestors, they are used to nomad lifestyles, wandering into the depth of the forest. The turning point of the life of Orang Rimba started during the land clearing of forest area for palm oil plantations since several years ago. Orang Rimba attempt to survive amidst the crisis in addition to the lengthy and extreme drought which was experienced by Jambi in 2015. Observations by BBC Indonesia in 2017 discovered the facts that, ‘forest fire which took place two years ago consumed a total area of 21,000 square kilometer (equivalent to thirty times of Singapore).’ The issues sustained by Orang Rimba reflect the tangible loss (decreasing quality and self-sustainability of the forest) as well as intangible loss (the deteriorating sociocultural order) which is highly likely experienced by other indigenous people in different parts of the world. The greatest contributor to the greenhouse emission in Indonesia come from variety of activities in land utilisation, transformation of land utilisation, and forestry. Transformation of forest land utilisation has been led by palm oil companies which have caused Orang Rimba to lose their homes. Activities of those companies have also increased the potential of climate disasters in Jambi area thus the forest areas have been frequently affected by long dry season and forest fires. In addition to changing the pattern of their lifestyle, the complexity of the issues have also threatened the capacity of Orang Rimba to determine their own way of life. It is an irony to witness how vulnerability, impact of climate changes, and demand for survivability have been able to change the indigenous people’s lifestyle. 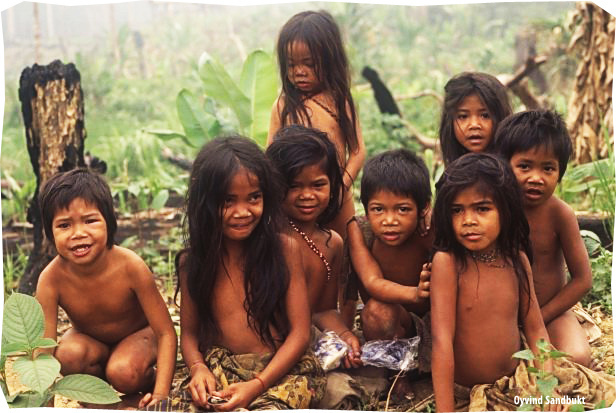 The citizenship and the belief of Orang Rimba toward the spirits of their ancestors have never been officially recognised by the state; therefore their access toward education, health, and other basic services are highly limited. These situations have also encouraged them to make decisions which did not even cross their minds. Abandoning the tradition of their forefather and the belief they have been practicing in order to enable them to survive. Inevitably, Orang Rimba has to choose a belief which is recognised by the government. The presence of permanent settlement developed by the government has forced Orang Rimba to settle down in a location. However, the attempt made by the government to encourage the indigenous people to adopt the new lifestyle is less than what they expect. Many houses were abandoned and they returned to their damage forests. Even though the indigenous people have been involved in the negotiation of international climate changes since 2008, at this point we are aware that the real impact of climate changes remain a threat to the life of indigenous people throughout the world. In addition to enhance our sensitivity toward the actual information relevant to the fate of the indigenous people, the negotiation attempt on global climate funding shall be carried out by prioritising fund optimalisation for the adaptation to climate changes. Through improved climate funding, a more effective adaptation management of climate changing may then be realised. Supervision during transitional period as well as introduction to renewable energy may become a fresh breakthrough for the adaptation of indigenous people toward climate changes. The source of livelihood is steadily decreasing while environmental changes constantly take place. The introduction of renewable energy may support the indigenous people in adapting their lifestyle such as fulfilling their needs on sanitation, food, and lighting. In addition to becoming a literacy media on ecologically friendly energy, the benefits of incorporating renewable energy will potentially open the opportunity to the indigenous people to lead a more dignified life as well as able to fulfill their needs on food and energy in a more independent manner. Indigenous people will be able to continue live freely without having to leave their local wisdom and tradition. These conditions are represented by the benefits of utilising domestic biogas (BIRU) technology for Samin and Rembang indigenous people and microhydro utilisation for indigenous people at Ciptagelar, Sukabumi. On the other hand, local wisdom of inidgenous people will certainly provide unique opportunity for the development of adaptation strategy toward climate changes. Local wisdom is made up of a number of insights relevant to the seasonal and climate changes in a specific area. Connecting adaptation of climate changes with local wisdom may increase the possibility of its acceptance and implementation of adaptation strategy by indigenous people. Global and national actions shall be taken immediately to save the sustainability of indigenous people lifestyle. The implementation of adaptation strategy toward climate changes by combining local wisdom and innovation in renewable energy may preserve the resilience of indigenous people when implemented seriously and systematically.